I build 50-story skyscrapers, I assemble cities of the future, I can certainly put together a goddamn diaper. 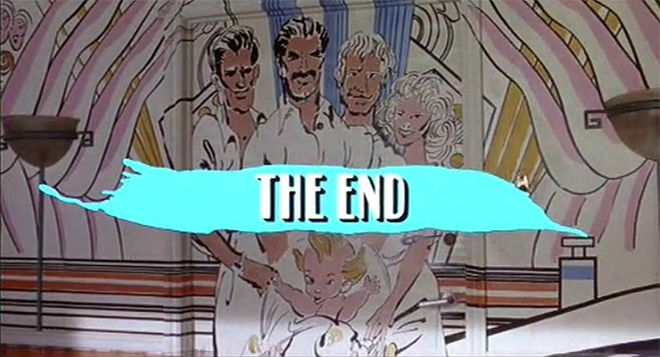 The Sistine Chapel may have its famous frescoed ceiling, but it doesn’t hold a candle to the New York bachelor pad of Peter, Michael, and Jack (Tom Selleck, Steve Guttenberg, and Ted Danson) seen in the opening of 1987’s Three Men and a Baby. An epic tribute of another sort adorns their well-trafficked vestibule: a massive mural honouring this trio of charming cads and their philandering ways. Michael (Guttenberg) is certainly no Michelangelo, but as the film rollicks into high gear to the tune of Miami Sound Machine’s “Bad Boy,” we nonetheless find ourselves marvelling both at his technique and devotion to this overblown exercise in ego. Three Men and a Baby is actor/director Leonard Nimoy’s remake of the 1985 French film Trois hommes et un couffin (Three Men and a Cradle). In classic 1980s form, the movie kicks off with a montage designed to speedily introduce the three titular bachelors, their professions, and their questionable relationships with women, as well as preface their hilariously inept foray into parenthood. Montage is an editing technique nearly as old as cinema, and whether sped up (like here) or slowed down (think Rocky 2), the method truly reached high art during this era. Combined with Penelope Gottlieb’s title design – tall Art Deco-style typography and a bubbly title card which perfectly complement Michael’s mural stylings – and it all comes together to create an unforgettable opening, despite all the misbehaviour and chauvinism on display. The opening of Three Men and a Baby is somewhat unusual in that it features credits for both the principal cast as well as their characters – the latter cleverly embedded as diegetic elements in the sequence. 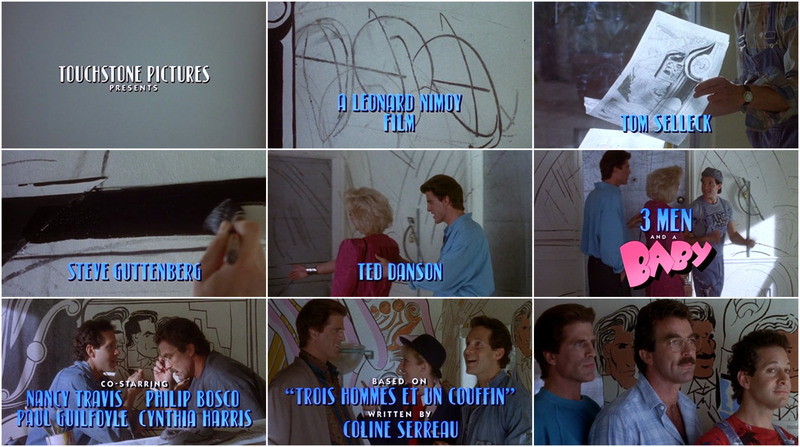 Nameplates reading “Designed by Peter Mitchell, Architect” and “Mural by Michael Kellam” effectively introduce Selleck and Guttenberg’s on-screen alter egos, while Danson’s Jack, though remaining nameless until the film proper, is established by way of his many trysts and one-night stands. When all's said and done the “Three Men” still have much to learn, but the film’s final shot provides a fitting bookend for its main titles.